The Women's Group was established right at the very start of the Kanyike Project and is a very powerful force in the villages. Women have great influence as they are traditionally important in the lives of the Ugandan family. Members generate income from activities such as agriculture and craft-making to drama productions. To kick-start new income-generating activities, women can obtain loans from the Kanyike Project. They repay the loan from their profits and then fund further ventures themselves. Large pots and pans have been bought using a loan to set up a catering business. This equipment makes it possible to cater for major events such as weddings or graduation parties with up to 500 guests. A group of village women now regularly travel to Kampala . The proceeds just cover the costs of food, staff, equipment etc so the business can continue. Again, a sustainable venture. Mama Teddy set up a shop with her loan. "From the profit of the shop, I started a nursery and I have 22 children attending. I charge them £3.50 per term." Noeline trades in agricultural produce with the money she was lent. She buys surplus food crops from the villagers and make a profit by by selling the food in markets in Kampala, where she gets a higher price. The money she makes is used to care for orphans she looks after. Edith used her loan to set up a business trading in second-hand clothes. Embroidery is a local tradition for the women of the villages. No patterns are used: everything is stitched freehand. The embroideries are sold, more materials are purchased with the profits and so more work and income are generated. 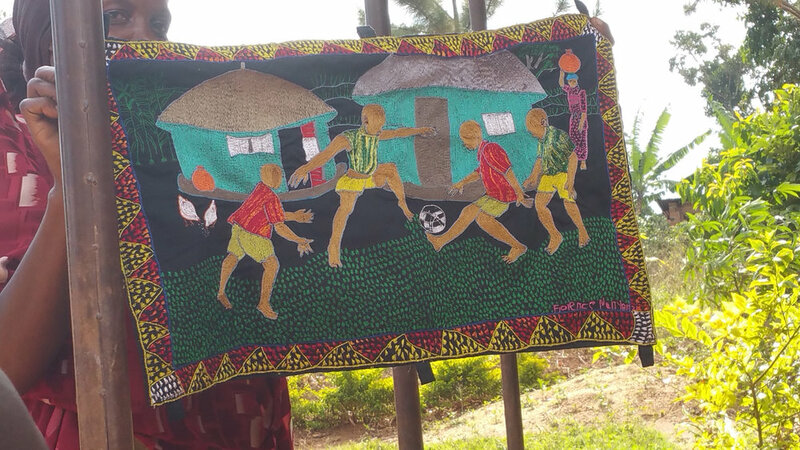 These beautiful embroideries show scenes from everyday life - basket weaving, cooking, a game of football and a typical village scene. The work of the Women's Group ensures the growth of the local economy and helps the community to become self-sustaining.